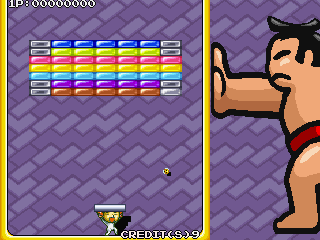 VS Block Breaker © 1997 Kaneko. Breakout featuring a jumping character and hilarious graphics. Developed by MediaWorks for Kaneko. MediaWorks was acquired by Kadokawa Shoten, in 2008, and was merged with ASCII. So, their name began 'ASCII MediaWorks'. They now have the direction of video games magazines and publishing imprints like: 'Dengeki Bunko', 'Nintendo Dreams', 'Dengeki Playstation', 'Dengeki G's Magazine'. This game is known in Japan as "Saru Kani Hamu Zou - Taisen Block Kuzushi", which translates from Japanese as 'Monkey Crab Hamster Elephant - Block Breaking Competition' ('Block Kuzushi'/'Block Breaking' is the Japanese name for 'Breakout').